This is my “NEW” Pumpkin Pie.I will forever make it with this recipe. Made with coconut sugar, the filling is lower in carbs and much higher in taste! Thanksgiving can’t wait make it today ! In a food processor blend flour, and salt. Add butter and pulse 10 times until mixture resembles wet crumbs. Add 1tablespoon water at a time until mixture starts come together. (You may not need all the cold water, just add a teaspoon at a time until the mixture is not too dry and not too wet.) If the butter starts to warm put mixture in the refrigerator for 15 minutes before continuing. Flatten dough into a 6” round, and wrap in plastic. Chill for 20-30 minutes. On floured surface using a rolling pin, rolling away from yourself and then back. Rotate dough with¼ turns -rolling and turning -rolling and turning until you have a 15” round. Transfer dough to the pie plate by folding it over the rolling pin and unrolling it onto pie plate. Fit the dough into plate and trim and notch the edges. Perforate the bottom with a fork and chill the shell for 20 minutes before baking. Bake until almost golden brown about 20 minutes. The shell will finish baking once you add the filling and bake the rest of the way. In a Kitchen aid with the paddle attachment or with a hand mixer- cream the cream cheese, the coconut sugar, and the sucant together. Add the pumpkin and blend well. Add eggs and yolks, butter, cinnamon and ginger. Place in oven and bake for 50-55 minutes. Cool completely and serve with a dollop of whipped cream on top. 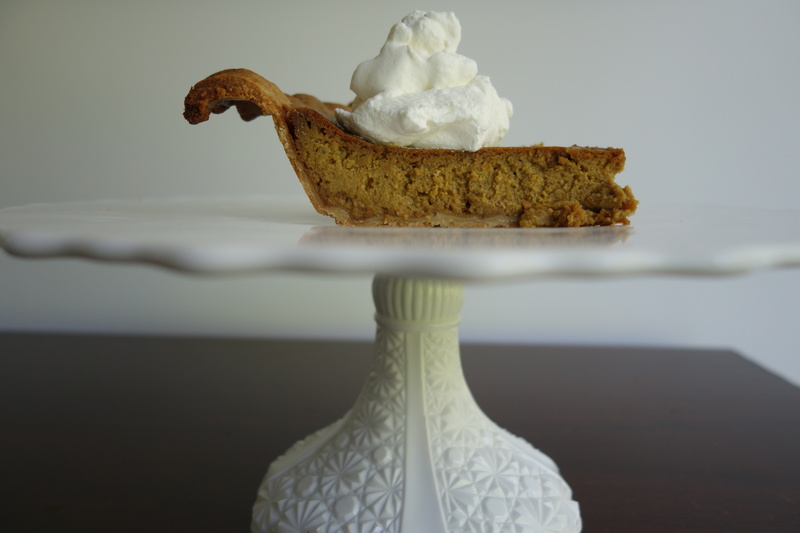 This entry was posted on Friday, November 15th, 2013 at 3:40 am	and tagged with better thanksgiving pumpkin pie, coconut sugar, homemade, low carbs, Short Crust Pie Shell, tasty, Thanksgiving pumpkin pie and posted in Category. You can follow any responses to this entry through the RSS 2.0 feed. I was just looking for a recipe for yummy pumpkin pie- your timing and vision for making food experience count is perfect! Looking forward to sharing with the family!